The Liverpool Telescope (LT) was one of the telescopes that recently gave British astronomers a direct grandstand view of a black hole eating a star and scattering the leftovers into space. Astronomers have spotted these stellar homicides before, but this is the first time they can identify the victim. Using a slew of ground- and space-based telescopes including the LT, a team of astronomers led by Suvi Gezari of Johns Hopkins University in Baltimore, Md., has identified the victim as a star rich in helium gas. The star resides in a galaxy 2.7 billion light-years away. Her team’s results will appear in the May 3 online edition of the journal Nature. The LT data "showed that the object stayed very blue even as it faded, thus showing that it was not a supernova, as they cool down with time," said Andy Lawrence, team member from the University of Edinburgh. “When the star is ripped apart by the gravitational forces of the black hole, some part of the star’s remains falls into the black hole, while the rest is ejected at high speeds. 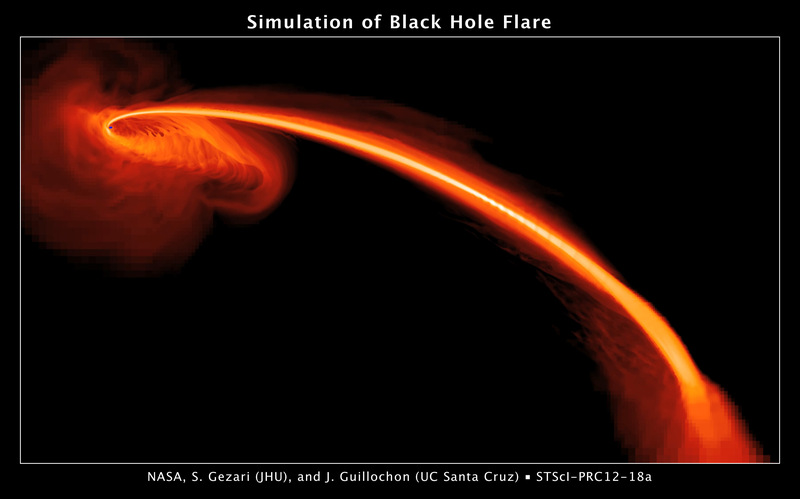 We are seeing the glow from the stellar gas falling into the black hole over time. We’re also witnessing the spectral signature of the ejected gas, which we find to be mostly helium. It is like we are gathering evidence from a crime scene. Because there is very little hydrogen and mostly helium in the gas we detect from the carnage, we know that the slaughtered star had to have been the helium-rich core of a stripped star,” Gezari explained. This observation yields insights about the harsh environment around black holes and the types of stars swirling around them. This is not the first time the unlucky star had a brush with the behemoth black hole. Gezari and her team think the star’s hydrogen-filled envelope surrounding the core was lifted off a long time ago by the same black hole. The star may have been near the end of its life. After consuming most of its hydrogen fuel, it had probably ballooned in size, becoming a red giant. 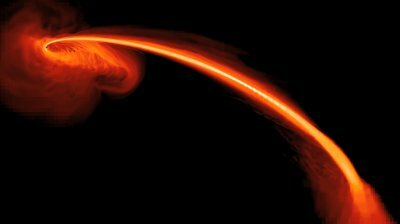 The astronomers think the bloated star was looping around the black hole in a highly elliptical orbit, similar to a comet’s elongated orbit around the Sun. On one of its close approaches, the star was stripped of its puffed-up atmosphere by the black hole’s powerful gravity. The stellar remains continued its journey around the center until it ventured even closer to the black hole to face its ultimate demise and was completely disrupted. Astronomers have predicted that stripped stars circle the central black hole of our Milky Way galaxy, Gezari pointed out. These close encounters, however, are rare, occurring roughly every 100,000 years. To find this one event, Gezari’s team monitored hundreds of thousands of galaxies with the Pan-STARRS1 telescope on Mount Haleakala, Hawaii. Pan-STARRS, short for Panoramic Survey Telescope and Rapid Response System, scans the entire night sky for all kinds of transient phenomena, including supernovae and Near Earth Asteroids, as well as the hoped for star-shredding events. PanSTARRS was built by astronomers in Hawaii, and operated by an international consortium, including British astronomers from Edinburgh, Durham, and Belfast. The same patch of sky was watched by GALEX, a space mission measuring ultraviolet light. The team was looking for a bright flare from the nucleus of a galaxy with a previously dormant black hole. 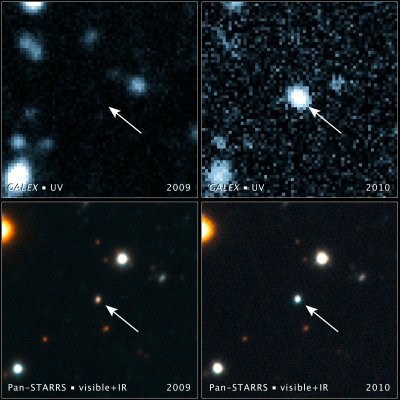 They found one in June 2010, which was spotted with both telescopes. Both telescopes continued to monitor the flare as it reached peak brightness a month later, and then slowly began to fade over the next 12 months. The brightening event was similar to that of a supernova, but the rise to the peak was much slower, taking nearly one and a half months. 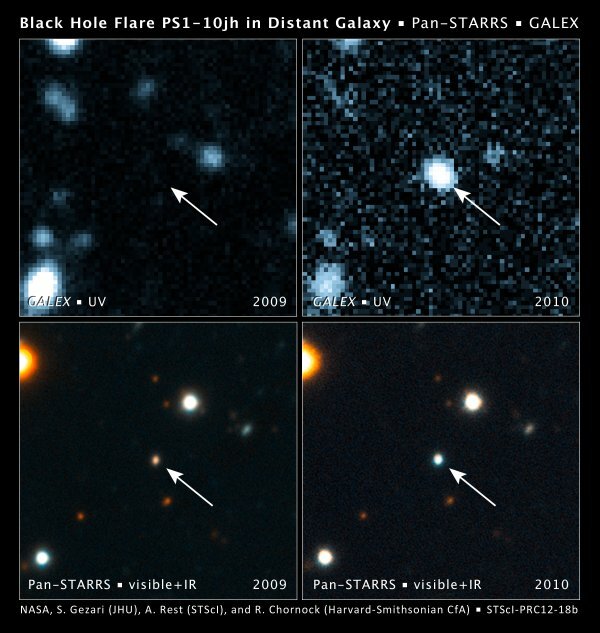 “The longer the event lasted, the more excited we got, since we realized that this is either a very unusual supernova or an entirely different type of event, such as a star being ripped apart by a black hole,” said team member Armin Rest of the Space Telescope Science Institute in Baltimore, Md. The observed speed of the gas also linked the material to a black hole’s gravitational pull. MMT measurements revealed that the gas was moving at more than 20 million miles an hour (over 32 million kilometers an hour). However, measurements of the speed of gas in the interstellar medium reveal velocities of only about 224,000 miles an hour (360,000 kilometers an hour). “As the object faded, it stayed hot, so we knew it wasn’t a supernova – they cool down” said Andy Lawrence. “The gas was moving fast, just like in Active Galactic Nuclei – but seeing only Helium was like nothing I’ve ever seen in an active nucleus”.